Is the view across the river lowlands to the north really worth so much more than that very same view to the south? Wilberforce and Pitt Town occupy the same stretch of valley on opposite banks of the Hawkesbury River but a life on the south-side will cost you a staggering $250,000 more. The gap grows even wider moving further along both banks of the river, with a property in Cattai on average costing $345,000 more than one in Ebenezer. The quality of life you can expect from each of the various riverside suburbs is not substantially different. Access to schools, shops and boat ramps are broadly similar, crime rates are comparable, demographics are much the same. It is true that there is a certain charm about the pretty little village of Pitt Town and the crisp newness of the Vermont estate, but access to larger parcels of land and the charming hills and stunning natural bushlands of Kurrajong and Bilpin are more accessible from the northern side of the river. A review of suburb profiles on realestate.com shows that between Pitt Town, Cattai, Wilberforce and Ebenezer, Wilberforce actually has the highest market demand with 942 visits per property listing compared with the average of 623 per property in the state. Pitt Town currently generates a much lower 649 visits per property but clearly has significantly more available stock. At the time of writing, Pitt Town had 44 properties on the market while neighbouring Wilberforce had only eight properties available for sale. Turnover is also pretty low. Usually, high demand coupled with low supply pushes prices up, but two issues seem to be negatively impacting property values on the north-side. The time taken to cross the Hawkesbury River at peak periods and the lack of access to high speed internet. These were important election issues in both recent local and federal elections and were significant contributing factors to the change in federal member and the shake-up of local council. The change in government presents fresh hope that these pressing issues will soon be resolved, and the current price disparity may well present opportunities for savvy buyers to get in before the gap closes. Buying a home in Wilberforce now rather than Pitt Town could save you over $300 per week in repayments. Buying one in Ebenezer now rather than Cattai could save you over $400 per week. 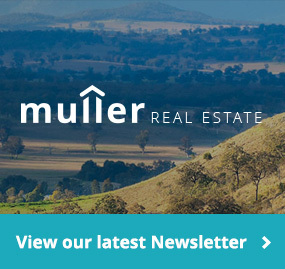 At Muller Real Estate, we manage a number of properties in Wilberforce and surrounding suburbs. We also specialise in off-market transactions in the region, so call us today and we’ll help you find the home you’ve been dreaming of.